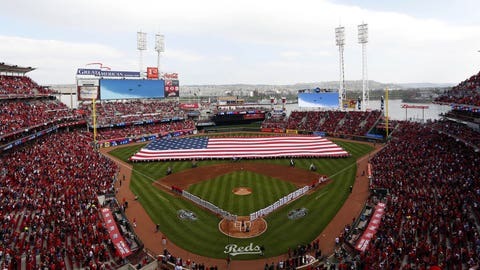 CINCINNATI, OHIO – As Cincinnati welcomes the start of the season and celebrates the 150th anniversary of professional baseball in 2019, FOX Sports Ohio is excited to announce its coverage of Cincinnati Reds Opening Day on Thursday, March 28th. Fans should tune in to FOX Sports Ohio starting at 9:00 a.m. for a full day of coverage of one of the biggest Opening Day celebrations in all of MLB. The network will feature interviews with guests from the Reds and local community with live coverage of the city-wide celebration. See below for the complete schedule. A broadcast team of 10, including broadcasters Chris Welsh, Thom Brennaman, Jim Day, Jeff Piecoro, Brian Giesenschlag, Sam LeCure, George Grande, Shannon Ford, Pat Barry and Katherine Nero, will all play a role. Debut of a new Links to the Game, featuring Reds LHP Kent Mercker and former Reds RHP Bronson Arroyo golfing with Welsh and PGA professional and golf host Jimmy Hanlin. Get to know Merker and Arroyo off the field as they join Welsh and Hanlin on the links at Kenwood Country Club in Cincinnati, Ohio. Piecoro and Giesenschlag will host from Washington Park. Grande will anchor from the Reds Live set at Great American Ball Park. Barry will report from Findlay Market. Ford will be live from the Reds Community Fund Charity Block Party at The Banks. Day and Nero will host parade coverage from Washington Park. Barry will report from parade step off area. Ford will continue to update from the Reds Community Fund Charity Block Party at The Banks. A special 90-minute Reds Live pre-game show will begin at 2:30 p.m. Giesenschlag, Piecoro and LeCure will host from the desk and Day will report from the field. The show, presented by Ray St. Clair Roofing, will provide fans commentary, features, and in-depth pre-game coverage including the on-field ceremonies. Local 12 WKRC-TV in Cincinnati will simulcast Reds Live pre-game show beginning at 2:30 p.m. as well as the game. Welsh and Brennaman will call the action. Immediately following the final out, Reds Live postgame show, presented by Performance Kings Honda, will include highlights, player interviews and analysis. Day will host from the desk and Piecoro will report from the dugout. If you’re not at home to catch FOX Sports Ohio’s coverage on TV, watch on the GO! You can watch the network’s coverage of the Reds on your phone or tablet with FOX Sports GO. FOX Sports GO is available to customers of participating pay-TV providers on iOS, Android, Fire tablets and Fire phones, Amazon Fire TV and Fire TV Stick, select Windows devices, and online at FOXSportsGO.com. Fans can download the mobile app for free from the iTunes App Store, Google Play, Amazon App Store and Windows Store. FOXSportsOhio.com will bring Reds fans the latest news all season long. The FOX Sports Ohio Reds Fan Express, presented by Kroger, will also be part of celebration. Look for the Reds 150thAnniversary-themed bus in the 100th Findlay Market Opening Day Parade. Chris Welsh will walk in the parade along with the West End Reds baseball and softball teams, FOX Sports Ohio’s sponsored youth organization in partnership with the Reds Community Fund. FOX Sports Ohio is the television home of the Cincinnati Reds, Cleveland Cavaliers, Columbus Blue Jackets, Columbus Crew, Cincinnati Bearcats, and ACC and Big East football and basketball. FOX Sports Ohio and sister network SportsTime Ohio present more live, local sports programming than any other network or broadcast system in the market, producing over 750 live sporting events including 4,800 hours of live and original programming every year Together, the two networks reach over five million households in Ohio, Kentucky, Indiana, western Pennsylvania, western New York, and West Virginia. For complete regional sports news, telecast schedules and updated statistics, log-on to www.FOXSportsOhio.com.